Car hire in Newcastle Upon Tyne is convenient, easy and flexible with Sixt. With our wide range of vehicles and great rates, we are sure to have something for every taste and budget. You can explore what fantastic bargains are available for car hire in Newcastle by checking out our seasonal special offers. We offer a variety of vehicles from our fleet in Newcastle upon Tyne available to cater to every requirement. From city compacts to family estates and luxury saloons, Sixt offers premium hire vehicles for business and private customers. If you wish to navigate the city with a group of friends or family you have the option to select a people carrier or minibus. Customise your Newcastle car rental by selecting from a range of additional upgrades. Our Glasgow car hire packages also come with the option of adding Sat Nav systems and child car seats, as well as winter tyres for the colder months. We even offer flexible rental terms including LDW waivers and insurance for under 25s. Students ought to be particularly excited to stay up-to-date with our student offers, which ensure that every penny counts when you book with Sixt. Newcastle Upon Tyne is a lively and diverse large port city in the North East of England. It has a buzzing atmosphere and interesting mix of architecture from its myriad past. Newcastle is home to some beautiful Georgian buildings, particularly impressive along the magnificent Grey Street which lies in the historic part of the city, Grainger Town. A modern architectural triumph and iconic landmark is the Gateshead Millennium Bridge which perfects the balance between pragmatic engineering and aesthetic beauty. Newcastle is a good starting point for tours of the Northumberland coast and Hadrian's Wall. Also not to be missed is the iconic modern sculpture, the Angel of the North, designed by Antony Gormley. 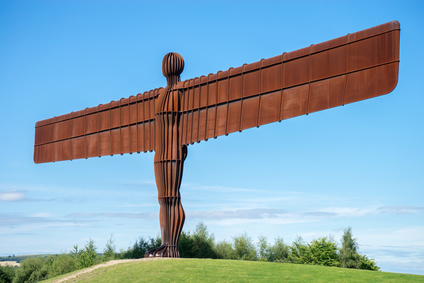 The 20m high steel structure with 54m long wingspan is one of Britain's best known pieces of outdoor art and overlooks the A1 road in and out of Newcastle.